Throughout history, there have been moments when the progress of technology has taken great steps forward, when a combination of the right tools, a capacity for innovation, and sparks of ingenuity lead to breakthroughs that transform how we live our lives. Executives in Kuala Lumpur, London, Mumbai, Abu Dhabi, Singapore, Mexico City and Hong Kong will acquire a comprehensive understanding of these technology trends and how they will impact business and society with Artificial Intelligence author and keynote speaker Edgar Perez. New York City, NY, USA — How we produce and process information is critical to innovation, and our methods of recording and communicating information have themselves undergone great leaps. At the same time, tools for processing and making sense of large quantities of data have developed exponentially, with Artificial Intelligence (AI) representing the latest leap. In the same way that Gutenberg’s press ushered in a new era of growth, data-driven technologies such as AI will underpin our future prosperity. The huge global opportunity AI presents is why the UK government identified AI and data as one of their Grand Challenges, in which the country could lead the world for years to come. The recently-announced Sector Deal is the first commitment from government and industry to realize this technology’s potential, outlining a package of up to £1 billion of support for the sector. The Sector Deal sets out actions to promote the adoption and use of AI in the UK, and delivers on the recommendations of the independent AI review, ‘Growing the AI industry in the UK’, led by Professor Dame Wendy Hall and Jérôme Pesenti1 (currently at Facebook). Their review engaged widely with businesses, academia, investors and other stakeholders on ways to boost the UK’s emerging AI sector at home and across the world. It sets out proposals to improve the institutions that support AI in the United Kingdom, to build a skilled workforce, and to stimulate access to data, collectively the lifeblood of any AI business. These programs go beyond technology, incorporating both short and long-term business impact; these courses allow participants to immediately capture the relevance and potential of these cutting-edge developments for their organizations. The Deep Learning / Artificial Intelligence Workshop for Today’s Strategic Leaders focuses on practical applications of artificial intelligence for businesses using TensorFlow, the most widely-used deep learning framework from Google. Deep learning is already impacting every part of business today; in fact, PwC has warned that automation could replace 38% of all American jobs by 2030. Deep learning will continue to be a rich source of insights from ever-growing data sets being evaluated by powerful algorithms, enabling companies to make better decisions. The Quantum Computing Workshop for Today’s Strategic Leaders will show CEOs how to learn to harness the opportunities unveiled by Quantum Computing, how to identify challenges and how to prepare their organizations for what the future holds. Powerful quantum computers will model all 19,000+ proteins in the human genome and simulate how new drugs can cure everything from the common cold to cancer. Invitations to these cutting-edge programs can be requested by email at mjp@gldnacademy.xyz. Edgar Perez is a great business speaker, a confident communicator and a world class motivator. Global executives have come to appreciate his wide-ranging insights on how they can better position their organizations for success through strong leadership and a comprehensive approach that links business strategy and disruptive technologies including artificial intelligence and deep learning, quantum computing and cyber security. A published author, keynote speaker and business consultant for private equity and hedge funds, he is Council Member at the Gerson Lehrman Group, Guidepoint Global Advisors and Internal Consulting Group. Mr. Perez is author of The AI Breakthrough, How Artificial Intelligence is Advancing Deep Learning and Revolutionizing Your World (2018), Knightmare on Wall Street, The Rise and Fall of Knight Capital and the Biggest Risk for Financial Markets (2013), and The Speed Traders, An Insider’s Look at the New High-Frequency Trading Phenomenon That is Transforming the Investing World, published in English by McGraw-Hill Inc. (2011), Published in Mandarin by China Financial Publishing House (2012), and Investasi Super Kilat, published in Bahasa Indonesia by Kompas Gramedia (2012). Mr. Perez has spoken at a number of global conferences, including Cyber Security World Conference (New York), Inside Market Data (Chicago), Emerging Markets Investments Summit (Warsaw), High-Frequency Trading Leaders Forum (New York, Chicago), MIT Sloan Investment Management Conference (Cambridge), CME Group’s Global Financial Leadership Conference (Naples Beach, FL), Harvard Business School’s Venture Capital & Private Equity Conference (Boston), Institutional Investor’s Global Growth Markets Forum (London), TradeTech Asia (Singapore) and FIXGlobal Face2Face (Seoul). In addition, Mr. Perez has presented to the Council on Foreign Relations, Vadym Hetman Kyiv National Economic University (Kiev), Quant Investment & HFT Summit APAC (Shanghai), U.S. Securities and Exchange Commission (Washington DC), CFA Singapore, Hong Kong Securities Institute, Courant Institute of Mathematical Sciences at New York University, University of International Business and Economics (Beijing) and Hult International Business School (Shanghai), among other public and private institutions. Mr. Perez has been interviewed on CNN’s Quest Means Business, CNBC’s Squawk on the Street, Worldwide Exchange, Cash Flow, Street Signs and Squawk Box, FOX BUSINESS’s Countdown to the Closing Bell and After the Bell, Bloomberg TV’s Market Makers, CNN en Español’s Dinero, Petersburg – Channel 5, Sina Finance, BNN’s Business Day, CCTV China, Bankier.pl, TheStreet.com, Leaderonomics, GPW Media, Channel NewsAsia’s Business Tonight and Cents & Sensibilities. In addition, Mr. Perez has been featured on Sohu, News.Sina.com, Caijing, ETF88.com, 360doc, AH Radio, CBNweek.com, Finance.Sina.com, The Korea Times, The Korea Herald, The Star, The Malaysian Insider, BMF 89.9, iMoney Hong Kong, Caixin, Futures Daily, Xinhua, CBN Newswire, Chinese Financial News, International Finance News, Finance.QQ.com, Bloomberg Hedge Fund Brief, The Wall Street Journal, The New York Times, Dallas Morning News, Valor Econômico, FIXGlobal Trading, TODAY Online, Oriental Daily News and Business Times. Mr. Perez has addressed thousands of top executives around the world through keynote speeches and corporate training programs on quantum computing, artificial intelligence, deep learning, cybersecurity and financial trading. He has presented in Beijing, Boston, Chicago, Hong Kong, Kiev, Kuala Lumpur, Lima, London, Miami, Naples, New York, Santiago, Sao Paulo, Seoul, Shanghai, Singapore, Stockholm, Taipei and Warsaw, among other global capitals. He contributes to The New York Times and China’s Sina Finance. Mr. Perez was a vice president at Citigroup, a senior consultant at IBM, and a strategy consultant at McKinsey & Co. in New York City. He managed Operations and Technology for Peruval Finance. Mr. Perez has an undergraduate degree in Systems Engineering from Universidad Nacional de Ingeniería, Lima, Peru (1994), a Master of Administration from Universidad ESAN, Lima, Peru (1997) and an MBA from Columbia Business School, New York, majoring in Finance and Management (2002). He belongs to the Beta Gamma Sigma honor society. Mr. Perez is an accomplished salsa and hustle dancer and resides in the New York City area with wife Olga, son Edgar Felipe and daughters Svetlana Sofia and Mary Olympia. The Deep Learning Workshop for Today’s Strategic Leaders in Stockholm, Brussels, Sao Paulo, Mexico City, Kuala Lumpur, Abu Dhabi, Seoul and Hong Kong will provide key insights into current and future developments for deep learning, with particular emphasis on what organizations can do today to leverage this revolutionary technology and apply it to their most pressing challenges. The Deep Learning Workshop for Today’s Strategic Leaders will provide key insights into current and future developments for deep learning, with particular emphasis on what organizations can do today to leverage this revolutionary technology and apply it to their most pressing challenges. Top executives of organizations around the world have heard a lot about artificial intelligence (AI). Within AI, there is machine learning, a technology that enables computers to get better at tasks with more practice. Furthermore, within machine learning, there is deep learning, which involves algorithms by which computers train themselves using multi-layered neural networks (inspired by the human brain) and vast quantities of data. This program focuses on practical applications of artificial intelligence for business using TensorFlow, the most widely-used deep learning framework from Google. Deep learning is already impacting every part of business today; in fact, PwC has warned that automation could replace 38% of all American jobs by 2030. Deep learning will continue to be a rich source of insights from ever-growing data sets being evaluated by powerful algorithms, enabling companies to make better decisions. Deep learning allows computational models that are composed of multiple processing layers to learn representations of data with multiple levels of abstraction. These methods have dramatically improved speech recognition, visual object recognition, object detection and many other domains such as financial trading, transportation, drug discovery and genomics. Deep learning effective and efficiently discovers intricate structure in large data sets by using algorithms to indicate how a machine should change its internal weights and biases that are used to compute the representation in each layer from the representation in the contiguous layer, which have brought about breakthroughs in processing images, video, speech, audio and financial data. 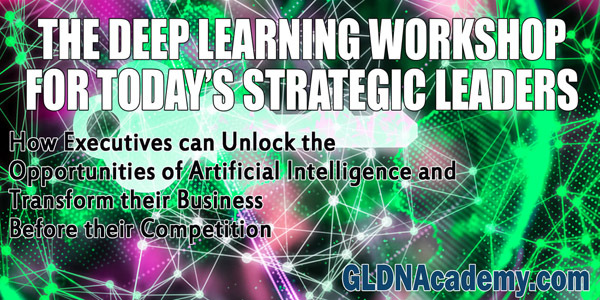 GLDNAcademy.com’s The Deep Learning Workshop for Today’s Strategic Leaders will show attendees how to harness the opportunities deep learning offers, how to identify challenges and how to prepare their organization for what the future holds. From financial trading to autonomous vehicles and from robotics to automated cancer diagnoses, practical applications for deep learning are already here and will impact businesses for years to come. Despite the ongoing cyber threat that is witnessed through news reports almost on a daily basis, firms are still neglecting proper cybersecurity planning. As information technology becomes ever more complex and Internet of Things applications progressively widespread, cybersecurity is becoming an increasingly important and business-critical field. Unfortunately, a recent study from security solutions provider Resilient Systems and market research firm Ponemon broke down key areas of continued failure for organizations. The study found that 66% of IT and security professionals surveyed said their firms were unprepared to recover from a cyber attack, and 75% lacked a formal incident response plan. A key example of this unpreparedness is that fact that many of the companies impacted by the WannaCry ransomware attack had not installed patches in their Windows infrastructure that were released by Microsoft months before. Vulnerabilities in commercial software are common; the only solution is to stay abreast of manufacturer’s releases. In order to help businesses in their cybersecurity planning, the Cybersecurity Framework released in February 2014 following a collaborative process involving industry, academia and government has been widely adopted by many types of organizations around the world, quickly becoming the de facto standard by which cyber security is going to be measured. GLDNAcademy.com’s The Cybersecurity Workshop for Today’s Strategic Leaders will bring leaders up to speed on the most recent and battle-tested approaches to protect their companies’ valuable information and intellectual property from prying eyes of hackers and competitors. Attendees to the program will learn how to apply the Cybersecurity Framework in their organizations and erect strong defenses for their valuable customer and employee data and intellectual property. Edgar Perez, former McKinsey and IBM consultant, is a global expert, author of The Speed Traders, Knightmare on Wall Street, and the course director of The Speed Traders Workshop 2015 Kuala Lumpur, “How Banks, Hedge and Mutual Funds and Brokers Battle Markets ‘RIGGED’ by Wall Street’s ‘Flash Boys’, High-frequency Trading, Exchanges and Dark Pools”. New York City, NY, USA (May 24, 2015) — The Speed Traders Workshop 2015 Kuala Lumpur, “How Banks, Hedge and Mutual Funds and Brokers Battle Markets ‘RIGGED’ by Wall Street’s ‘Flash Boys’, High-frequency Trading, Exchanges and Dark Pools” (http://www.thespeedtradersworkshop.com), is the first and most comprehensive initiation to the world of high-frequency trading with Edgar Perez, author of Knightmare on Wall Street (http://www.knightmareonwallstreet.com), and will open the door to the secretive world of computerized low-latency trading, the most controversial form of investing today; in the name of protecting the algorithms they have spent so much time perfecting, speed traders almost never talk to the press and try to disclose as little as possible about how they operate. Mr. Perez is the author of Knightmare on Wall Street, The Rise and Fall of Knight Capital and the Biggest Risk for Financial Markets (2013), and The Speed Traders, An Insider’s Look at the New High-Frequency Trading Phenomenon That is Transforming the Investing World, published in English by McGraw-Hill Inc. (2011), Published in Mandarin by China Financial Publishing House (2012), and Investasi Super Kilat, published in Bahasa Indonesia by Kompas Gramedia (2012). Mr. Perez has been engaged to present to the Council on Foreign Relations, Vadym Hetman Kyiv National Economic University (Kiev), Quant Investment & HFT Summit APAC 2012 (Shanghai), U.S. Securities and Exchange Commission (Washington DC), CFA Singapore, Hong Kong Securities Institute, Courant Institute of Mathematical Sciences at New York University, University of International Business and Economics (Beijing), Hult International Business School (Shanghai) and Pace University (New York), among other public and private institutions. In addition, Mr. Perez has spoken at a number of global conferences, including Cyber Security World Conference 2014 (New York), Inside Market Data 2013 (Chicago), Emerging Markets Investments Summit 2013 (Warsaw), CME Group’s Global Financial Leadership Conference 2012 (Naples Beach, FL), Harvard Business School’s Venture Capital & Private Equity Conference (Boston), High-Frequency Trading Leaders Forum (New York, Chicago), MIT Sloan Investment Management Conference (Cambridge), Institutional Investor’s Global Growth Markets Forum (London), Technical Analysis Society (Singapore), TradeTech Asia (Singapore), FIXGlobal Face2Face (Seoul) and Private Equity Convention Russia, CIS & Eurasia (London). Learn how to communicate more effectively with clients and colleagues. Sarasota, FL, USA (April 27, 2015) — Training for Entrepreneurs.com (TFE), a web-based entrepreneurial Business Resource and Learning Center, is pleased to announce today that enrollment is open for the micro-learning workshop, Communicating Effectively. 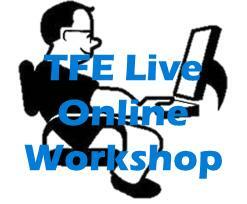 This Live Instructor-Led Online Workshop will take place Wednesday, May 6th at 2:00 pm EST. The purpose of the Communicating Effectively Workshop is to equip participates with a range of tools, tactics, and techniques that will help them to communicate more effectively with clients and colleagues, making their communication more impactful, persuasive, and confident. The Workshop provides participates with the opportunity to understand how communication works and how to communicate with confidence and flair. This Workshop is suitable for those individuals who want to express themselves more effectively and maximize their impact in front of an audience. The Communicating Effectively Workshop is a micro-learning event that provides training in a short – 90 minute — digestible, bite-sized unit that is readily accessible via devices such as mobile phones, tablets, laptop, and desktop computers. This micro-learning event helps to address the problem of dwindling attention spans and provides next-gen workforce training with a less time-consuming, less-costly, more laser-focused learning experience than traditional training methods. Learn more about this live, online event and to reserve a seat for this May 6th 2:00 pm EST Workshop, visit http://www.trainingforentrepreneurs.com/communicating-effectively-workshop. TFE is a web-based business resource and learning center that works in three primary areas: Facilitators of a web-based entrepreneurial development community, Creators & Publishers of educational content for small and medium-sized businesses, and Trainers & Mentors of live online Soft Skills Workshops, live Virtual Mentoring Programs, and live onsite Workforce Training Seminars. For more information, call 941-556-1299 or visit http://www.TrainingforEntrepreneurs.com. Building off of the momentum of past successful workshops, Golden Networking brings Cybersecurity Boardroom Workshop 2015 (http://www.CybersecurityBoardroomWorkshop.com), seminar specifically designed for board members and senior executives of public and private firms looking for new ways to gain and maintain competitive business advantage. New York, NY, USA (January 20, 2015) — In the days prior to Thanksgiving 2013, malware designed to steal credit card data at Target was surreptitiously installed. According to Bloomberg BusinessWeek, the company had installed a malware detection tool. Target had specialists in Bangalore to monitor its computers around the clock. Two days after Thanksgiving, the malware was spotted. The team in India got an alert and flagged Target’s security managers. And then? Nothing happened. Target’s alert system had worked effectively. But then, Target stood by as 40 million credit card numbers flowed out of its computers. Only a few months later, CEO Gregg Steinhafel and CIO Beth Jacob were both out of the company. Cybersecurity has become widely recognized as a critical corporate challenge. Boards and senior managements are putting it on their agenda, categorizing cybersecurity not as a compartmentalized risk for the information technology team, but as strategic and enterprise-wide. However, a security program is only as strong as its weakest link. While a survey by the Institute of Internal Auditors found 58% of board members felt they should be actively involved in cybersecurity preparedness, only 14% said they were actively involved. Unfortunately, 65% also said their perception of the risk their organizations faced had increased. Board members and senior managers need to become more educated about the topic to be able to ask questions that are strategic yet granular enough to address company-specifics. To go further, it will be imperative to join Cybersecurity Boardroom Workshop 2015 (http://www.CybersecurityBoardroomWorkshop.com), the first seminar targeted at strategic and executive leaders for whom cybersecurity readiness is a relatively new yet critically important area to be intelligently conversant about. Cybersecurity Boardroom Workshop 2015 is specifically designed for board members and senior executives of public and private firms looking for new ways to gain and maintain competitive business advantage. Business executives with responsibility for IT, finance, compliance, risk management and procurement as well as entrepreneurs and innovators are welcome. Cybersecurity Boardroom Workshop 2015 is produced by Golden Networking, the premier networking community for business and technology executives, entrepreneurs and investors. Panelists, speakers and sponsors are invited to contact Golden Networking by sending an email to information@goldennetworking.com. 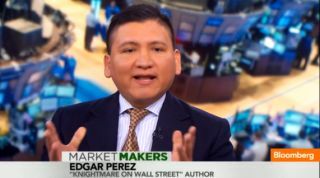 Edgar Perez, Author, The Speed Traders and Knightmare on Wall Street, Presenting The Speed Traders Workshop DVD Video Package, How High Frequency Traders Leverage Profitable Strategies to Find Alpha in Equities, Options, Futures and FX. Mr. Perez is widely regarded as the preeminent global expert in the specialized area of high-frequency trading. He is author of The Speed Traders, An Insider’s Look at the New High-Frequency Trading Phenomenon That is Transforming the Investing World, published in English by McGraw-Hill Inc. (2011), published in Mandarin by China Financial Publishing House (2012), and Investasi Super Kilat: Pandangan Orang dalam tentang Fenomena Baru Frekuensi Tinggi yang Mentransformasi Dunia Investasi, published in Bahasa Indonesia by Kompas Gramedia (2012); and Knightmare on Wall Street, The Rise and Fall of Knight Capital and the Biggest Risk for Financial Markets, a thrilling minute-by-minute account of the terrifying hours following Knight Capital’s August 1, 2012 trading debacle, with news-breaking research regarding the firm’s 17 years of tumultuous existence as an independent company. Mr. Perez contributes to The New York Times and China’s International Finance News and Sina Finance. He has been interviewed on CNBC Worldwide Exchange, CNBC Cash Flow, CNBC Squawk Box, BNN Business Day, CCTV China, Bankier.pl, TheStreet.com, Leaderonomics, GPW Media, Channel NewsAsia Business Tonight and Cents & Sensibilities. In addition, he has been globally featured on FXFactor, Columbia Business, OpenMarkets, Sohu, News.Sina.com, Yicai, eastmoney, Caijing, ETF88.com, 360doc, AH Radio, CNFOL.com, CITICS Futures, Tongxin Securities, ZhiCheng.com, CBNweek.com, Caixin, Futures Daily, Xinhua, CBN Newswire, Chinese Financial News, ifeng.com, International Finance News, hexun.com, Finance.QQ.com, Finance.Sina.com, The Korea Times, The Korea Herald, The Star, The Malaysian Insider, BMF 89.9, iMoney Hong Kong, CNBC, Bloomberg Hedge Fund Brief, The Wall Street Journal, The New York Times, Dallas Morning News, Valor Econômico, FIXGlobal Trading, TODAY Online, Oriental Daily News and Business Times. Mr. Perez has been engaged to present at the Council on Foreign Relations, Vadym Hetman Kyiv National Economic University (Kiev), Quant Investment & HFT Summit APAC 2012 (Shanghai), U.S. Securities and Exchange Commission (Washington DC), CFA Singapore, Hong Kong Securities Institute, Courant Institute of Mathematical Sciences at New York University, University of International Business and Economics (Beijing), Hult International Business School (London and Shanghai) and Pace University (New York), among other public and private institutions. In addition, he has spoken at a number of global conferences, including Emerging Markets Investments Summit 2013 (Warsaw), CME Group’s Global Financial Leadership Conference 2012 (Naples Beach), Harvard Business School’s Venture Capital & Private Equity Conference (Boston), High-Frequency Trading Leaders Forum (New York, Chicago, London), MIT Sloan Investment Management Conference (Cambridge), Institutional Investor’s Global Growth Markets Forum (London), Technical Analysis Society (Singapore), TradeTech Asia (Singapore), FIXGlobal Face2Face (Seoul) and Private Equity Convention Russia, CIS & Eurasia (London). Mr. Perez was a vice president at Citigroup, a senior consultant at IBM, and a strategy consultant at McKinsey & Co. in New York City. He has an undergraduate degree from Universidad Nacional de Ingeniería, Lima, Peru (1994), a Master of Administration from Universidad ESAN, Lima, Peru (1997) and a Master of Business Administration from Columbia Business School, New York, with a dual major in Finance and Management (2002). He belongs to the Beta Gamma Sigma honor society. He resides in the New York City area and is an accomplished salsa and hustle dancer. The Speed Traders, published by McGraw-Hill Inc., is the most comprehensive, revealing work available on the most important development in trading in generations. High-frequency trading will no doubt play an ever larger role as computer technology advances and the global exchanges embrace fast electronic access. The Speed Traders explains everything there is to know about how today’s high-frequency traders make millions-one cent at a time. 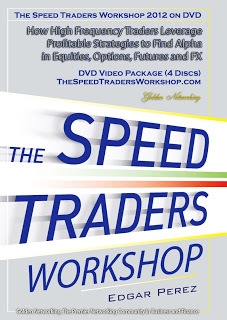 The Speed Traders Workshop DVD Video Package reveals how high-frequency trading players are succeeding in the global markets and driving the development of algorithmic trading at breakneck speeds from the U.S. and Europe to India, Singapore and Brazil. The Speed Traders Workshop brings the most updated review of high frequency trading to the world’s most important financial centers. Edgar Perez, Former McKinsey & Co. Consultant, Author, The Speed Traders, Presenting The Speed Traders Workshop DVD Video Package, How High Frequency Traders Leverage Profitable Strategies to Find Alpha in Equities, Options, Futures and FX. New York City, NY, USA (August 12, 2013) — Edgar Perez, former McKinsey consultant and Adjunct Professor at the Polytechnic Institute of New York University and author of The Speed Traders, is presenting The Speed Traders Workshop DVD Video Package: How High Frequency Traders Leverage Profitable Strategies to Find Alpha in Equities, Options, Futures and FX (http://TheSpeedTradersWorkshopDVD.eventbrite.com), the world’s most comprehensive review of high frequency trading now available for the very first time on DVD in an insightful 4-disc set. Mr. Perez is widely regarded as the preeminent global expert in the specialized area of high-frequency trading. Mr. Perez (http://www.mredgarperez.com), former McKinsey and IBM consultant, is Chairman of High-Frequency Trading Leaders Forum 2013, author of The Speed Traders (http://www.thespeedtraders.com), An Insider’s Look at the New High-Frequency Trading Phenomenon That is Transforming the Investing World (McGraw-Hill Inc., 2011), (China Financial Publishing House, 2012), and Knightmare on Wall Street, The Rise and Fall of Knight Capital and the Biggest Risk for Financial Markets (http://www.knightmareonwallstreet.com). 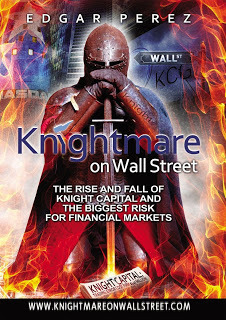 A thrilling minute-by-minute account of the terrifying hours following the August 1, 2012 trading debacle, with news-breaking research regarding Knight Capital’s 17 years of tumultuous existence as an independent company, Knightmare on Wall Street, The Rise and Fall of Knight Capital and the Biggest Risk for Financial Markets, is the definitive behind-the-scenes story of Knight Capital. Mr. Perez is course director of The Speed Traders Workshop 2012, How High Frequency Traders Leverage Profitable Strategies to Find Alpha in Equities, Options, Futures and FX (Hong Kong, Sao Paulo, Seoul, Kuala Lumpur, Warsaw, Kiev, New York, Singapore, Beijing, Shanghai) and was Adjunct Professor at the Polytechnic Institute of New York University, where he taught Algorithmic Trading and High-Frequency Finance. He contributes to The New York Times and China’s International Finance News and Sina Finance. Mr. Perez has been interviewed on CNBC Cash Flow, CNBC Squawk Box, BNN Business Day, CCTV China, Bankier.pl, TheStreet.com, Leaderonomics, GPW Media, Channel NewsAsia Business Tonight and Cents & Sensibilities. In addition, Mr. Perez has been featured on Sohu, News.Sina.com, Yicai, eastmoney, Caijing, ETF88.com, 360doc, AH Radio, CNFOL.com, CITICS Futures, Tongxin Securities, ZhiCheng.com, CBNweek.com, Caixin, Futures Daily, Xinhua, CBN Newswire, Chinese Financial News, ifeng.com, International Finance News, hexun.com, Finance.QQ.com, Finance.Sina.com, The Korea Times, The Korea Herald, The Star, The Malaysian Insider, BMF 89.9, iMoney Hong Kong, CNBC, Bloomberg Hedge Fund Brief, The Wall Street Journal, The New York Times, Dallas Morning News, Valor Econômico, FIXGlobal Trading, TODAY Online, Oriental Daily News and Business Times. 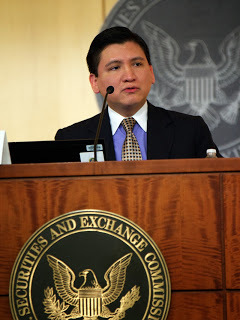 Mr. Perez has been engaged to present to the Quant Investment & HFT Summit APAC 2012 (Shanghai), U.S. Securities and Exchange Commission (Washington DC), CFA Singapore, Hong Kong Securities Institute, Courant Institute of Mathematical Sciences at New York University, University of International Business and Economics (Beijing), Hult International Business School (Shanghai) and Pace University (New York), among other public and private institutions. In addition, Mr. Perez has spoken at a number of global conferences, including CME Group’s Global Financial Leadership Conference 2012 (Naples Beach, FL), Harvard Business School’s Venture Capital & Private Equity Conference (Boston), High-Frequency Trading Leaders Forum (New York, Chicago), MIT Sloan Investment Management Conference (Cambridge), Institutional Investor’s Global Growth Markets Forum (London), Technical Analysis Society (Singapore), TradeTech Asia (Singapore), FIXGlobal Face2Face (Seoul) and Private Equity Convention Russia, CIS & Eurasia (London).